Kathia Arango, director of the archdiocesan Office for Hispanic Catholics. 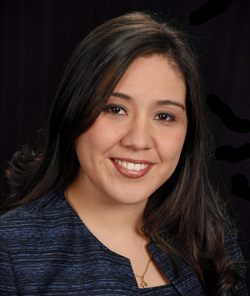 Kathia Arango, who joined the archdiocesan staff as director of the Office for Hispanic Catholics this month, comes to the Archdiocese of Philadelphia at an exciting time. Hispanic ministry is growing exponentially year by year and that is not likely to change in the foreseeable future. A great deal of Arango’s duties will be working among immigrants from all over Latin America, and she brings to the table a personal knowledge. A native of Paraguay with degrees in accounting and administration, she was a manager in the construction field before she came to the United States when she married her husband, Andres Arango, who is the Bishop’s Delegate for Hispanic Ministry in the Camden Diocese. She also has worked for the Camden Diocese in the Office of Lifelong Faith Formation/Lay Ministry Formation since 2010, and is active in leadership in the Hispanic Charismatic Renewal movement both locally and nationally. She is currently completing studies for a master’s degree in theology at Georgian Court University. She and her husband are parents of 3-year-old twins Giovanna and Nicole and are members of Our Lady of Peace Parish, Williamstown, N.J.
For her part, Arango sees her task is applying what she has already been doing in Camden to the much larger field in Philadelphia. “I’m looking and learning right now,” she said. Another issue unique among immigrants is that so many, especially men, come to work in this country but leave their family behind, at least temporarily. “We must help them keep their relationship with the family, and the community is sometimes a second family,” Arango said. She also believes there is a need for more resources to be applied to Hispanic ministry including “vocation programs, formation programs, and education programs to try to insert the Hispanics into the church,” she said. This involves helping Latinos become acculturated in America and at the same time respecting the values and culture they bring with them. “The challenge is to find a way to have diversity with unity,” she said.